A conservative attempt of therapy should always come first, if that is in any way feasible. 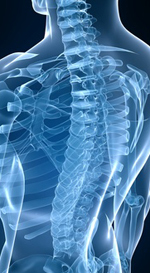 One main focus is the non-surgical (conservative) treatment of spinal disorders. The full special pain therapy is carried out in collaboration with the Algesiologikum MCC Pain Therapy Centre of Munich at our headquarters (Tal 16). Dr (IMF Bucharest ) Johanna Marek covers the full range of physical and rehabilitation medicine. Alternative and standard medical procedures should not be considered competing but complementing each other. 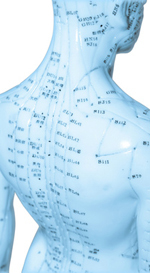 Complete relief from pain can be often reached by kinesiotaping or acupuncture. Our therapeutic portfolio includes the implantation of cerebral stimulation systems in case of complicated pain conditions (neuronal stimulator implantation) or of drug pumps and reservoirs. 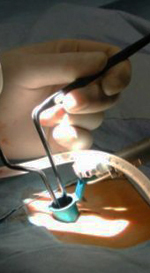 Micro surgery is the ‘gold standard’ for hemiated discs and stenosis near the spinal canal. Ideal illumination with the surgical microscope helps decompress nerve structures at low risk. A brief stay in the clinic will usually suffice. The follow-up treatment should be done on an outpatient basis. If a stationary rehabilitation programme should be still required, this will be organised by the social service of our hospitals. The patient should take it easy for about 14 days and return to the familiar social environment as quickly as possible. 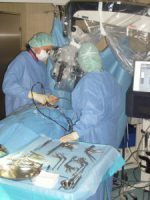 This kind of surgery is our specialty, very frequently carried out at patients from all over Germany and abroad. If several segments of the cervical, thoracic or lumbar spine are worn out or an intervertebral disc is protruded, then back pain patients may find relief in epidural anaesthesia. Here, the main nerve tube is washed with a mixture of a highly efficient anti-inflammatory crystal preparation and a long-lasting local anaesthetic. Deeply rooted back and nape pain is often caused by chronic irritation of the intervertebral joints. A common cause of deeply rooted back and nape pain is chronic irritation of the intervertebral joints. Effective drugs or microinstruments are locally introduced to the site through the skin, supported by imaging (CT or tiltable X-ray device). 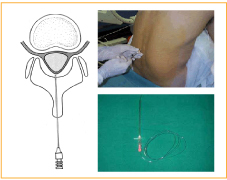 This procedure bears little risk and is done on an outpatient basis. When pain can be attributed to a specific nerve root, a special drug combination may be injected right at the irritated nerve, supported by X-ray imaging (PRT: periradicular therapy). One advantage of this procedure is the specific injection of the drug to where the pain originates. This procedure bears little risk and is done on an outpatient basis. 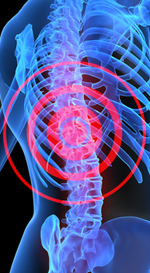 Spinal wear renders the pain receptors of an injured intervertebral disc over-sensitive (discogenic pain). These receptors can be thermally switched off using a probe introduced in the disc. This procedure is also called radio frequency therapy. To achieve even better efficacy, this procedure is often combined with a peridural pain catheter (see Epidural Anaesthesia). When indicated, hemiated discs can be removed by the ‘key-hole method’ through the skin (percutaneously). The benefit of this method is that the patient will quicker recover, staying only for a night in the hospital. By exactly placing a tube with the help of X-ray imaging, slipped discs can be removed endoscopically. Unstable vertebra segments may suggest specific stiffening. This should be indicated only after extensive diagnostics and failure of all conservative procedures. Available instrumentations are either dorsal or dorsoventral (in the latter case it may be paired with disc prosthesis). Choosing the best procedure must be made a function of the clinical and radiological findings. The carpal tunnel syndrome (CTS) is treated with endoscopic or open methods, according to findings. For the ulnar sulcus syndrome (USS), the nerve is exposed only in open surgery. According to findings, most different methods are available here. If any condition of that kind is present, we will inform you about all available therapies. We are also ready to answer every conceivable question, no matter whether you want to know what exactly will be done or how or under which conditions. In case of emergency we are available 24/7! 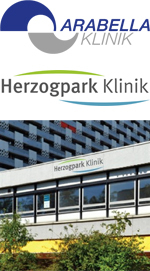 In case of emergency, you can call us any time outside of our consulting hours via the Arabella- and Herzogsparkklinik complex (Arabellastrasse 5 or Arabellastrasse 9-11). One of our neurosurgeons is 24 hours on stand-by for our stationary patients and emergency cases and will arrive in the hospital within 15 minutes, if needed. Another experienced colleague is any time available in the hospital. Please, tell us what is eating you – we will get in touch with you.